St Andrew’s Parish Church, Inverurie was founded in the 9th century by the Culdee monks on the left bank of the River Don at its junction with the Polnar Burn on the lands of Baddifurrow now known as the estate of Manar. It was known as the “Kirk of Rocharl”. Soon after the erection of the “Kirk of Rocharl”, two dependent chapels were built – one at Montkegy (now the parish of Keithhall, part of the united parish of Fintray, Keithhall and Kinellar) – the other beside the hillock known as “The Bass”. A fort stood on this mound and this latter chapel was probably built to accommodate the settlers within and around the stronghold on the banks of the River Ury. A Manse was built there and the kirkyard also grew around it. This graveyard is now known locally as “The Bass” or “The Old Cemetery”. During the reign of Malcolm Canmore (1057) and his Queen, Margaret, Inverurie was created one of the new Saxon parishes with its dependent chapel at Montkegy placed under the care of the Abbey of Lindores in Fifeshire. In the 14th century, (during the reign of King Robert the Bruce) the Chapel at Polnar lost its importance and was doomed to fall into decay, while the Church at the Bass assumed the name and dignity of the parish church. This daughter chapel of the “Kirk of Rocharl” (now the parish church) was ultimately to become the real centre of Christ’s faith in the district until 1774, while the church at Monkegy remained dependent on Inverurie until 1631. The first recorded vicar of the parish was Dominus Ricardus, who was ministering to the parish in 1262. The first General Assembly of the Kirk in Scotland met in 1560, and thirteen years later Inverurie received its first minister, the Rev George Paterson who was also “Bishop” of the Garioch. He had supervision of Daviot, Montkegy, Kinkell and Kintore. Later he was commissioned to superintend all the Kirks in the Presbytery, the Laigh of Mar, and also the Mearns, north of the Mounth. The third Church of Scotland minister of Inverurie, (Alexander Mill – a royal “presentee” of King James I), had the Manse transferred from the Bass to the site of the present Kirk before 1600, by the Sketry Burn. It was Mill who established the first school in Inverurie, built at the Market Place. During the ministry of Mill’s successor (William Forbes – minister, 1644 – 1679), the Kirk Session met weekly. Four ministers were appointed in turn after Forbes. In 1770 William Davidson was inducted as minister of Inverurie. During his ministry a “mystery church” was built on the present site of the Kirk in 1775, using stones from the old Kirk at “The Bass”. Sixty-six years later it was demolished, for reasons lost with the passage of time. Davidson’s successor (Robert Lessell – minister, 1800 – 1853) was responsible for the building of the present building on the site, erected to the Glory of God and dedicated as such on 14th August, 1842. Only a year later, in 1843, the first General Assembly of the Free Church took place in Edinburgh. In 1877 the “Free Kirkers” built their present church on the West High Street, Inverurie. Lessell’s successor (John Davidson – minister, 1854 – 1892) was, like most of Inverurie’s ministers (including the present one) a schoolmaster. 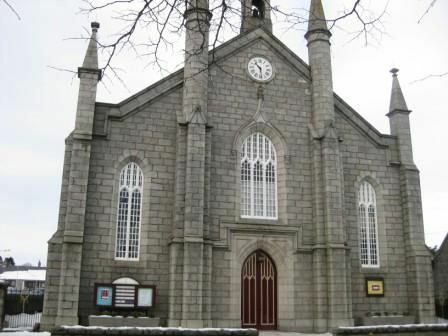 St Andrew’s Parish Church, Inverurie is part of The Church of Scotland. It was founded in the 9th century by the Culdee monks on the left bank of the River Don at its junction with the Polnar Burn on the lands of Baddifurrow now known as the estate of Manar. It was known as the “Kirk of Rocharl”. Lessell’s successor (John Davidson – minister, 1854 – 1892) was, like most of Inverurie’s ministers, a schoolmaster.